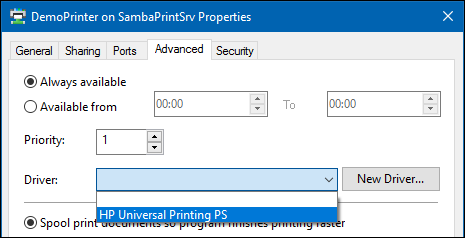 If you are running a Samba print server for Windows clients, you can upload drivers and preconfigure printers. 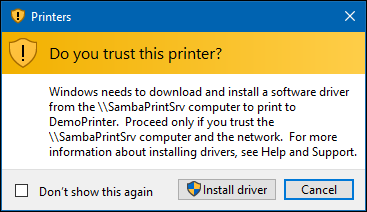 If a user connects to a printer on the Samba server, Windows automatically downloads the driver and installs it locally. The user does not require local administrator permissions for the installation. Additionally, Windows applies preconfigured driver settings, such as paper sizes and the number of trays. Before you can set up automatic printer driver download, configure Samba as a print server and share a printer. For details, see Setting up Samba as a Print Server. If the driver is provided in a compressed format, unpack the archive. Some drivers are require to start a setup application that installs the driver locally on a Windows host. In certain cases, the installer extracts the individual files into the operating system's temporary folder during the setup. To use the driver files for uploading them to a Samba print Server, start the installer, copy the files from the temporary folder to a new location, and cancel the installation. Ask your printer vendor, if the driver supports uploading to a print server for automatic download by Windows operating systems. Samba only supports the printer driver model version 3 that is supported in Windows 2000 to 10 and Windows Server 2000 to 2016. Enable the spoolssd service. For details, see Enabling the spoolssd Service. The driver model version 4, introduced in Windows 8 and Windows Server 2012, is not supported in Samba. Use version 3 drivers instead. Printer drivers for the 64-bit Windows architecture, you can only upload from a Windows 64-bit operating system. 32-bit drivers you can upload from both 32-bit and 64-bit Windows operating systems. To provide driver for both architectures, you must upload 32-bit and 64-bit drivers that uses exactly the same name for both architectures. For example, if you are uploading the 32-bit HP Universal Printing PS driver and the 64-bit HP Universal Printing PS (v5.5.0) driver for Windows, the driver names are different and cannot be used and preconfigured for the same printer. Using the default setting, Samba reports itself as Windows NT x86 architecture. Thus, 64-bit drivers stored on this print server can only be assigned to a printer if additionally a 32-bit driver with exactly the same name is uploaded. 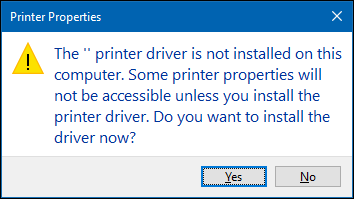 Otherwise, Windows does not display the driver in the list displayed in the printer's properties when assigning the driver. Only users and groups having the SePrintOperatorPrivilege privilege granted can upload and preconfigure printer drivers. You can grant this privilege to any user or group. # net rpc rights grant "SAMDOM\Domain Admins" SePrintOperatorPrivilege -U "SAMDOM\administrator"
# net rpc rights list privileges SePrintOperatorPrivilege -U "SAMDOM\administrator"
Windows downloads printer drivers from the print$ share of a print server. This share name is hard-coded in Windows and cannot be changed. When setting up a Samba print server on an Active Directory (AD) domain controller (DC), you cannot use POSIX access control lists (ACL). Use the Windows utilities to set extended ACLs. For details, see Enable Extended ACL Support in the smb.conf File. For details, see Setting Share Permissions and ACLs. Samba automatically creates the architecture subdirectories on the print$ share when uploading a driver. In July 2016, Microsoft released an update to fix security issues in the Windows print spooler. This update changes the behaviour and limited support for non-package-aware printer drivers. In October 2016, Microsoft published an update to mitigate these problems in an Active Directory (AD). For further details, see MS16-087. This section describes the procedure to work around the problems in an AD. Enter a name for the GPO, such as Legacy Printer Driver Policy. The new GPO is shown below the domain entry. Navigate to the Computer Configuration → Policies → Administrative Templates → Printers entry. Enable Users can only point and print to these servers and enter the fully-qualified domain name (FQDN) to the field. Select Do not show warning or elevation prompt in both the When installing drivers for a new connection and When updating drivers for an existing connection list. Enable the policy and click the Show button. 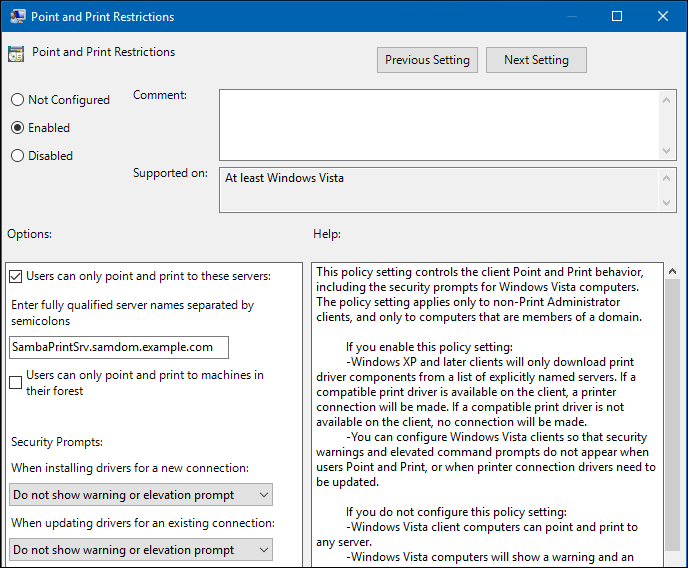 Close both the content and policy properties by clicking OK.
Log on to a Windows host using an account that has the SeDiskOperatorPrivilege privilege granted and write permissions on the print$ share. Click Start, enter Print Management, and start the application. Right-click to the Print Servers entry and select Add/Remove Servers. Enter the name of the Samba print server in the Add servers field, and click Add to List. When you are connected to the print server, you can perform certain tasks, such as uploading drivers and preconfiguring printers. Navigate to the Print Servers entry, double-click your print server, and right-click to the Drivers entry. In upcoming wizard, select the architecture you want to upload a driver for, and select Next. Click Have Disk and navigate to the folder containing the printer driver for the selected architecture. Select the driver to upload from the list. When you upload 32-bit and 64-bit drivers for the same printer, both drivers must have exactly the same driver name. For details, see 32-bit and 64-bit Drivers. Click Finish to start uploading the driver to the print$ share. After uploading, the driver is shown in the Drivers menu. Optionally, upload drivers for additional architectures. Navigate to the Print Servers entry, double-click your print server, and select the Printers entry. Right-click to the printer and select Properties. Click No. The driver is selected in a later step from the list of uploaded drivers. If you uploaded only a 64-bit driver and the driver is not displayed in the list, see Uploading Only 64-bit Drivers to a Samba Print Server. Click OK to set the driver for the printer. If a warning is displayed, cancel the operation and set up a group policy to trust drivers provided by this print server. 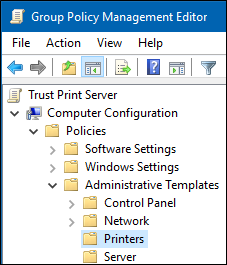 For details, see Creating a GPO for Trusting the Print Server. Right-click to the printer and select Rename. Reset the printer name to the name set in the smb.conf file, and press Enter. If the printer list is not refreshed automatically, press the [F5] key. # rpcclient localhost -U "SAMDOM\administrator" -c "enumdrivers"
# rpcclient localhost -U "SAMDOM\administrator" -c "enumprinters"
If the administrator preconfigured the driver on the print server, users connecting to the printer getting automatically the settings applied as default. Preconfigured settings are applied automatically to all driver platforms for the printer, if drivers for multiple architectures are installed on the server. For details, see 32-bit and 64-bit Drivers. Connect to the print server. See Connecting to the Print Server Using the Print Management Console. Depending on the driver, a tab, such as Device Settings, is provided that enables you to set general settings, such as installed paper trays. To preconfigure further settings, navigate to the Advanced tab and click Printing Defaults. Update all settings you want to preconfigure. For example, paper sizes and the default paper source. Save the advanced settings and the printer properties by clicking OK. This page was last modified on 27 September 2017, at 12:19. This page has been accessed 80,619 times.